Chicago’s new concert amusement tax will mean fewer jobs for Chicago workers! The Coalition to Save Jobs in the Amusement Industry represents the thousands of workers and their families who have the most to lose if the concert amusement tax passes. Chicago politicians want to raise concert amusement taxes by 80%. Not only will that make Chicago home to some of the highest concert and entertainment amusement taxes in the country, it puts Chicago jobs at risk. Fewer shows will mean fewer jobs. There is no amusement in taxing people out of jobs. But that is exactly what will happen if this concert amusement tax passes. Chicago hotel workers, restaurant and bar staff, and retail salespeople all count on fans for business. 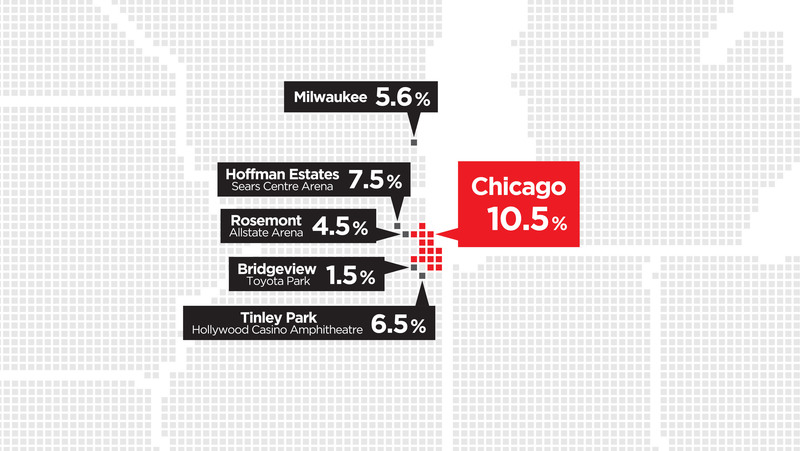 But, higher concert amusement taxes will drive shows to venues outside of Chicago to more tax-friendly local cities. Or worse – some shows may bypass Chicago altogether. Higher concert amusement taxes will mean fewer shows. Fewer shows will mean fewer people. Fewer people will mean less business. Less business will mean fewer jobs. The losses will be felt in hotel occupancy, restaurants and bars, retail stores, stadiums, arenas and most importantly – jobs and wages. It’s time to stop the concert amusement tax increase. Chicago politicians just voted to increase concert amusement taxes by a whopping 80%, making Chicago home to some of the highest amusement taxes in the country. This short-sighted tax will mean fewer shows in the city, meaning less work for the thousands of hotel, restaurant and venue employees who count on these shows to support their families. The vote has put thousands of Chicago jobs at risk but our work is not over. We will continue to advocate for the thousands of Chicago workers in the amusement industry.